This is a sculpture of an acorn as it begins its life as an oak tree, with leaves and shoots unfurling and reaching for the sun. It's over 5 feet tall and was built with 15,581 pieces. The sculpture took over 200 hours to design and build. Each piece is glued one-by-one and a steel armature helps keep the sculpture secured to the ground and sturdy in high winds. My assistant, Geoffrey, took the lead on the design and construction of this sculpture. 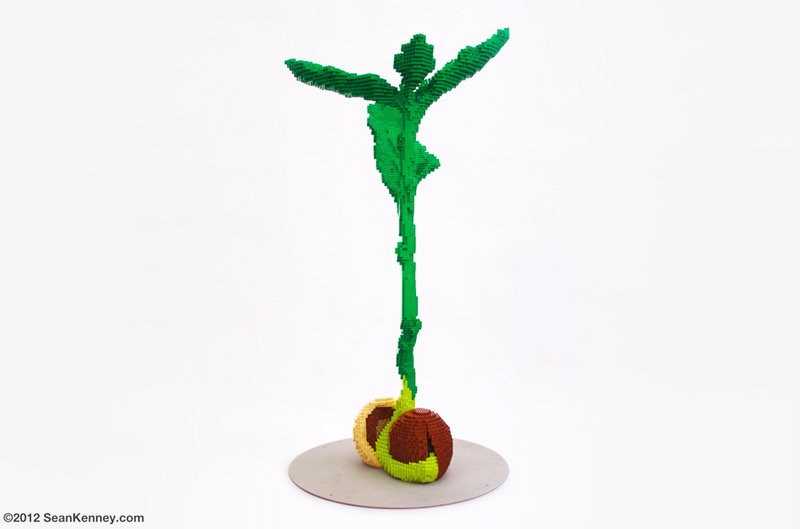 LEGO sculptures are very difficult when they are either thin or horizontal, and the leaves in this sculpture are thin AND horizontal! Working around steel can be hard enough, a there were a lot of tricky challenges that Geoffrey overcame. And it makes for an excellent coatrack.